Get your own on-demand Creative Team to ensure your brand stays beautiful.  Leverage highly skilled designers, video pros and writers on-demand to create what you need when you need it. Our talented Creative Team helps your brand stand out in the crowd & win more business. Creating great designs, content and videos take time. Save time by allowing us to do it for you! We’re fast & the quality is top notch. Save money by avoiding an expensive, in-house team. 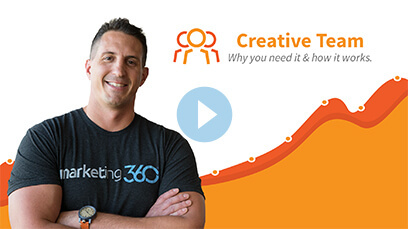 With Marketing 360®, you get access to highly skilled creative talent on-demand. The better your designs, content & videos, the better your results. Stand out over your competitors as the one with the most beautiful brand. Designers, developers, video pros, writers oh my! 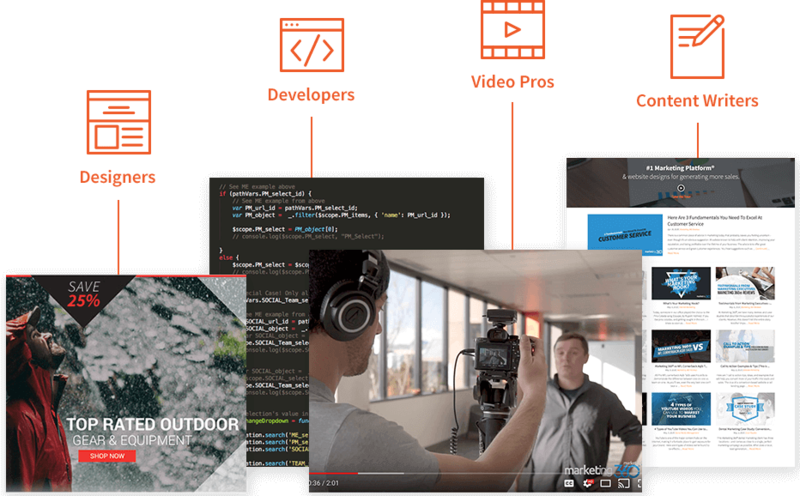 Leverage highly skilled designers, developers, video pros and content writers on-demand to create what you need when you need it. Get 1 hour of Creative Time per month free. Add additional time if/when needed. Save money by avoiding an expensive, in-house team. 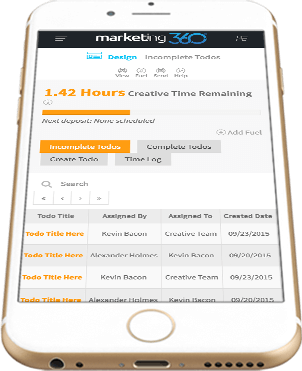 Assign & track whatever creative work you need done with ease right through Marketing 360®. Or, simply have your Marketing Executive do it for you! It really doesn’t get any easier and the quality of work and turnaround time is unmatched. It’s like having your own in-house team! If you can think it we can do it when it comes to video & photography! Whether you need a simple short video for social media or a TV-grade commercial, we have you covered. Our designers and developers can create beautiful and convertible websites and landing pages fast and to the highest standard. All you need to do is ask! Our email marketing specialists are skilled at designing effective emails and writing convertible copy. Just tell them what you need and they’ll get it done! Need a new banner designed for your website, social media, a magazine ad or something else? No problem, our designers eat banner ads for breakfast. Want company branded t-shirts, hoodies, hats, pens, bags, or anything else you can think of? No worries, we’ll design, print and ship you whatever you’d like. We can design, print and ship you business cards, letterhead, fliers, or any other print-related product you may need. We can even design car wraps and trade-show displays! If you need anything written by a professional writer, we’re here to help! We can write blog posts, press releases, news articles, landing page content, product descriptions- the list goes on. Essentially, when it comes to design, video and content, if you can think it, we can do it. All you need to do is ask! We’ll let you know how much time it will take and if you approve, we’ll get it done. Just let your Marketing Executive know what you need when you need it and they’ll take care of the rest. 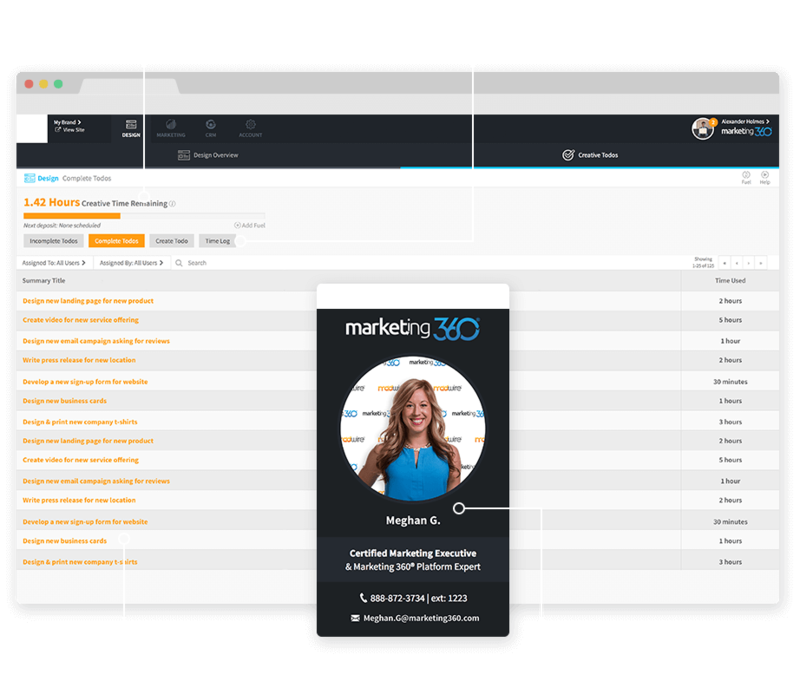 Or, assign a todo yourself through Marketing 360®. Once the work is done, you’ll have a chance to review it, approve it, or request revisions. We take great pride in our quality of work and turnaround speed. Once everything is done and approved, we’ll provide you the work and/or take it live on your behalf. Get 1 hour of Creative Time free per month with your account and add additional Creative Time you might need on-demand. This way, you only pay for what you need as you need it!